/mo. for 24 months. Pricing, speeds, and availability vary by location. Requires 2-year agreement, enrollment in Autopay and E-bill. 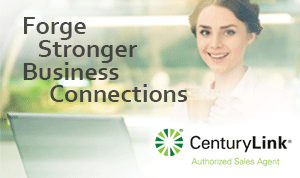 Expand your capabilities with CenturyLink Business Class Pure Broadband 40. CenturyLink High-Speed Internet (HSI) offers download speeds up to 40 Mbps. Work faster and smarter with CenturyLink Internet 40 for your business - downloading large data files, stream training sessions, perform daily website maintenance and back-ups, connect with remote employees or partners with online conferencing, set up your POS system - all of this and more can be accomplished with ease. Call today and get your business connected for a great low price!